It was supposed to revolutionise transportation as we know it, so why is the Segway Human Transporter nowhere to be seen on the streets of Britain? If you believed the hype, the world's first motorised, self-balancing scooter was going to revolutionise personal travel when it was introduced into the UK two years ago. Segway inventor Dean Kamen wanted it to become a fixture on traffic-clogged city streets, allowing commuters to "drive" to work at the civilised speed of 12mph. Great assumptions were made. Mr Kamen said it would "be to the car what the car was to the horse and buggy". His vision has yet to be realised. After a flurry of publicity things have gone pretty quiet and the UK's commuters are still jamming themselves into cars, trains, buses and tubes every morning. No official sales figures are released by Segway but there are just 30 to 50 of the machines estimated to be in the country, according to its UK distributor - BAE Systems. The low sales can in part be put down to the legal nightmare the two-wheeled scooter finds itself in, as well as an average price tag of £2,800. Segways are designed for use on the pavement, but the only motorised vehicles allowed alongside pedestrians in the UK are electric wheelchairs and mobility scooters. 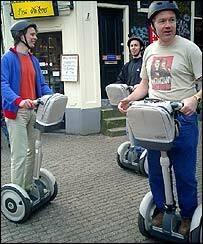 It would require Parliament to change the law for the Segway to become legal. BAE has been lobbying hard for such a change, but as yet without success. It is a frustrating situation, especially when many other European countries have been pro-active in passing legislation to support the Segway. "We are trying to increase public awareness about the situation so people ask why such a green machine could not be authorised for use in the UK," says Segway HT business manger, Andy Hughes. France has been especially keen to embrace it and Segway tours of Paris, Lille and Nice are now available. Sales in Europe are predicted to outstrip those in the US in the next few years, according to Segway's vice president of international business, Claude Le Blond. "Growth is better than expected, we're doing well," he says. Without sales figures it is hard to judge just how well that is, but considering the US now holds an annual SegwayFest for devotees it is probably safe to say they outstrip the handful so far shifted in the UK. While the legal wrangles continue, BAE has been establishing where else the Segway can be best used, resulting in a new model with golf bag attachment and an off-road one for more rugged terrain. Both growth markets, it says. Some companies have also bought them for use in warehouses and at airports. The success of the Segway could come down to the market it is pitched at, according to Ed Griffiths, designer with product design company JEDCo. He says a two-wheeled scooter that is used on the pavement and goes at 12mph is being pitched as an alternative to walking. "But walking is free, natural and we all know how to do it, so why pay thousands for a Segway?" he says. "And if you don't want to walk why not get a bike, again it's much cheaper. The Segway doesn't seem to have massive practical benefits over other products or our own legs. "To sell a product you've got to have a need. The Segway is a bit like fine art, it's desirable but not really necessary. It has a novelty value, but that won't make it a sales success." Professor Dominic Kelly, who has an interest in UK and European transport policy, says Segway may also have misjudged the psychology of travel. "It is all about getting from one place to another faster and more comfortably," he says. 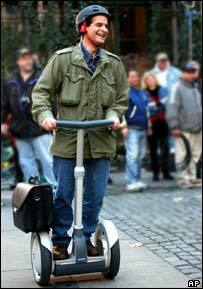 "The Segway is not fast or particularly comfortable and that makes it a bit of a gimmick. "I think it is more suited to sedate activities, like golf. We are becoming more of a leisure society so the Segway may not revolutionise the way we travel, but it could transform some aspects of the way we have fun."